WACO, Texas—Lowell (Mich.) High School head coach Noel Dean has been named the 2011 Power of Influence Award recipient. Dean was nominated by the Michigan High School Football Coaches Association (MHSFCA). Presented jointly by the American Football Coaches Association® and the American Football Coaches Foundation®, the award will be given to Dean at the AFCA Coach of the Year Dinner on Tuesday, January 10, at the 2012 AFCA Convention in San Antonio, Texas. The Power of Influence award was created as a way for the AFCA and AFCF to honor a deserving high school football coach. Coaches who receive this award are recognized for their impact on their team and players, as well as the legacy they leave with the school and community. This award is not based on wins and losses; however, it is noted that coaches of powerful influence have longevity and success. It is the first AFCA award specifically designed to honor a high school coach. Dean began his coaching career in 1991 at Bendle (Mich.) High School. During his time there, he led the school to it’s first ever playoff appearance and was named MHSFCA Regional Coach of the Year in 1995, a year in which his team made it to the semi-finals. 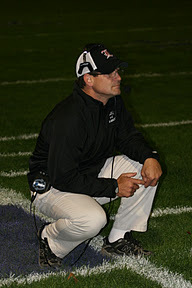 Dean left Bendle in 1996 and became the head coach at Lowell High School. Dean’s record at Lowell is 160-28 at the time of release and boasts three State Championships, five semi-final appearances, five regional titles and seven district titles. Dean’s teams have been recognized four times for being Academic All-State and four times for being the top Community Service program. His overall coaching record stands at 182-54 from 1991 to present. In addition to his outstanding record on the field, Dean and his teams have raised over $425,000 to build the most comprehensive cancer support system in the nation for one town through Dean’s, “Pink Arrow Project,” for breast caner awareness. Dean also worked to rebuild the senior neighbors’ home in Lowell to benefit the seniors of Lowell and established reading grants for the Michigan High School Coaches Association. Weekly, Dean and his wife provide meals to Gilda’s Club members who are learning to cope with cancer. In addition to the 2011 Power of Influence Award, Dean has received several other recognitions. 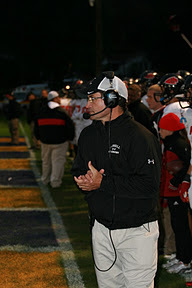 He has been honored nine times as MHSFCA Regional Coach of the Year, and was named State Coach of the Year three times. In 2000, he was named AP Coach of the Year. He was granted AP Honorable Mention four times and Detroit News Coach of the Year three times. In 2004, he was named Detroit Lions Coach of the Year and Grand Rapids Press Coach of the Year in 2009. Other finalists for this year’s award were: Paul Maechtle, Southeast Hills High School (Bradenton, Fla.); Rick Wimmer, Fishers High School (Fishers, Ind. ); Don Melby, Pike Valley High School (Scandia, Kan.); Mark Wortman, Elkhorn High School (Elkhorn, Neb. ); Jeff Furguson, Totino Grace High School (Fridley, Minn.); Steve Hancock, Branson High School (Branson, Mo. ); Tom Culver, Avon High School (Avon, S.D. ); Glenn McCadams, David Lipscomb High School (Nashville, Tenn.); Larry Hill, Smithson Valley High School, (Spring Branch, Texas); Brad Lutz, Broadway High School (Broadway, Va.); and Peter Moe, Washburn High School (Washburn, N.D.). Past Power of Influence Award winners include: Larry Dippel, Amarillo (Texas) High School (2002); John McKissick, Summerville (S.C.) High School (2003); Marcus Borden, East Brunswick (N.J.) High School (2004); Ron Stolski, Brainerd (Minn.) High School (2005); Sid Otton, Tumwater (Wash.) High School (2006); Rob Younger, Sweet Home (Ore.) High School (2007); George Smith, St. Thomas Aquinas (Fla.) High School (2008), Jim Drewry, Booneville (Miss.) High School (2009), and Brent Steuerwald, Shenendehowa (N.Y.) High School (2010).